Microsoft comes under fire for many (most?) of its products. Some people say they’re stodgy, poorly produced and unoriginal. However, that’s not the case with Microsoft’s desktop hardware range. Its keyboard and mouse products usually get nothing but praise, and the good news is that the company has just unveiled its latest offerings. The Wireless Laser Desktop 7000 is the newest in a long line of 2.4GHz keyboard and mouse sets, and it looks like a very nice progression. It’s still only a keyboard and mouse set, so there’s nothing especially groundbreaking about the new products. But if you've recently upgraded to Windows Vista, the 7000 keyboard has many-a-button designed especially for you. It features a “Windows Aero-inspired translucent design, floating Hot Keys and instant access to Windows Flip 3D”. Microsoft says it makes this desktop set a “perfect companion for today’s Windows Vista-based PC”. 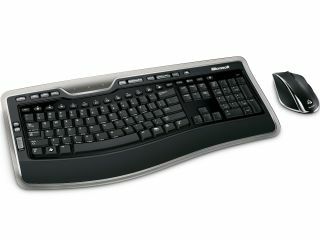 The traditional ergonomic design of Microsoft’s keyboards has been enhanced too, so it looks like being the most comfortable yet. But that’s enough blabbering about a Microsoft keyboard. If you want to try one out, the Wireless Laser Desktop 7000 will be released next month and will cost in the region of 70 or 80 quid.